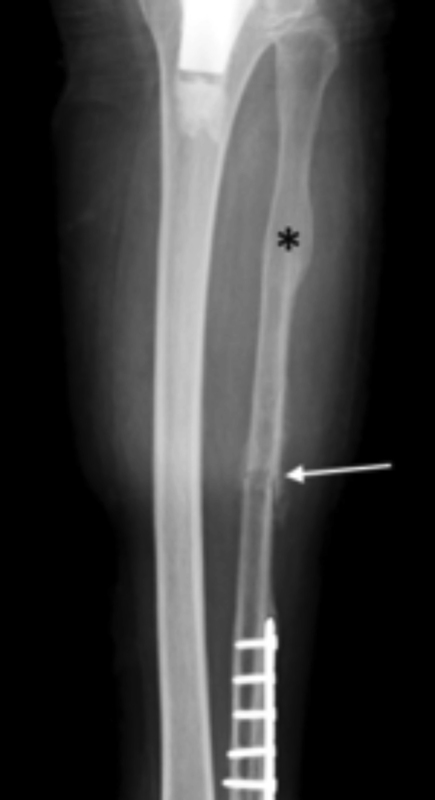 An 18-year-old lacrosse player presented with persistent bilateral lower extremity pain, for which nuclear medicine scintigraphy was performed (Figure 1). Lower extremity pain is a common complaint across age groups. In many situations, the clinical picture may be suggestive, but is often not definitive for a specific diagnosis. Radiographs are often the first study of choice but may be normal or equivocal. 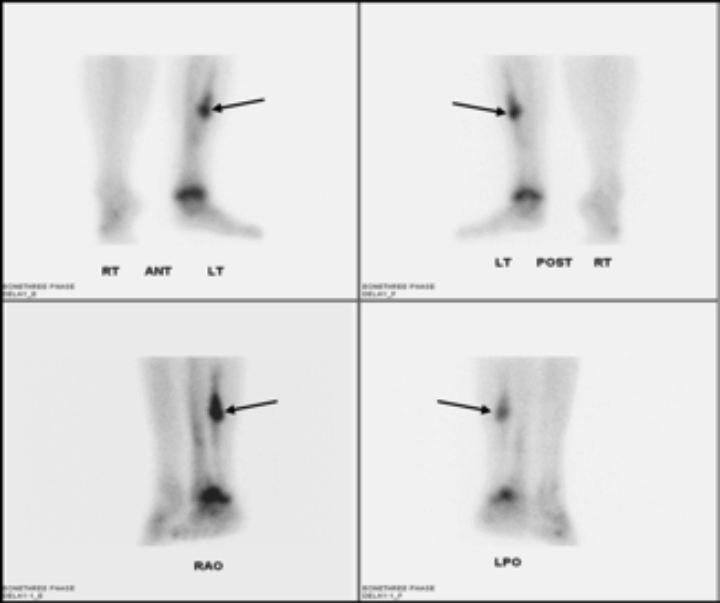 Bone scintigraphy has long been a popular and accessible next imaging option of choice and may provide useful information as to the etiology of lower extremity pain, impacting patient treatment and management options. Common conditions demonstrating a linear pattern of lower limb long bone activity include medial tibial stress syndrome (MTS), fractures, and osteomyelitis, detailed below. Other uncommon etiologies, such as venous stasis and hypertrophic pulmonary osteoarthropathy, are not discussed in this case review. Medial tibial stress syndrome (MTS), colloquially known as shin splints, results from repetitive stress injury to the leg. The clinical presentation is exertional leg pain localized along the posterior medial border of the middle and/or distal thirds of the tibias. Radiographs are typically normal (Figure 2). Tc-99m bone scintigraphy has long been a useful tool in confirming this syndrome and excluding more severe pathologic mimics. Abnormal delayed phase uptake is typically seen in most, but not all, proven cases of MTS.1 Perfusion and blood pool phases are typically normal. 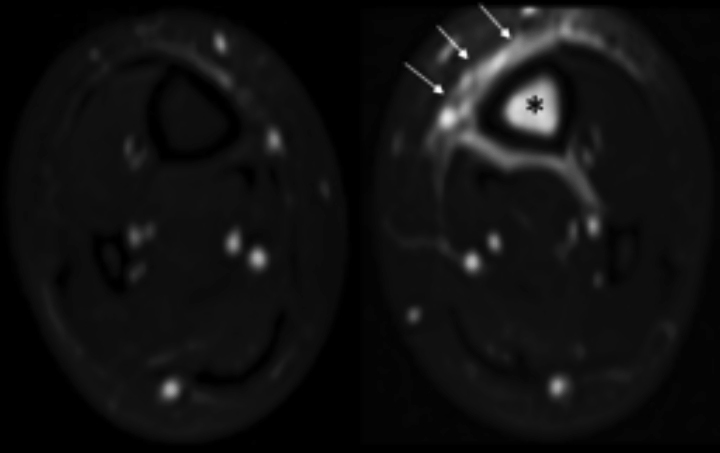 Three patterns of uptake are closely associated with MTS: superficial uptake along the anterior and posterior tibial cortices (double stripe sign),2 localized middle to distal tibial posteromedial cortex activity (Figure 1),3 and tubular pattern of tibial activity.4 MTS most commonly involves at least one-third of the tibial shaft, is usually bilateral, and is often asymmetric and heterogenous. Infection shares the hyperperfusion, hyperemic, and intense delayed phase activity that is seen in fractures and can be focal, fusiform, linear, or diffuse in distribution (Figure 5). The scintigraphic appearance has a high accuracy (> 90%) in the setting of high clinical index of suspicion, but a low specificity if the clinical presentation is equivocal.7 Additional studies, such as radiographs, MRI, indium-111-labeled autologous-leukocytes, or biopsy may be required for diagnostic confirmation. The high negative predictive value of a normal bone scintigraphy represents its best utility. Treatment may include antibiotics and/or surgical debridement. 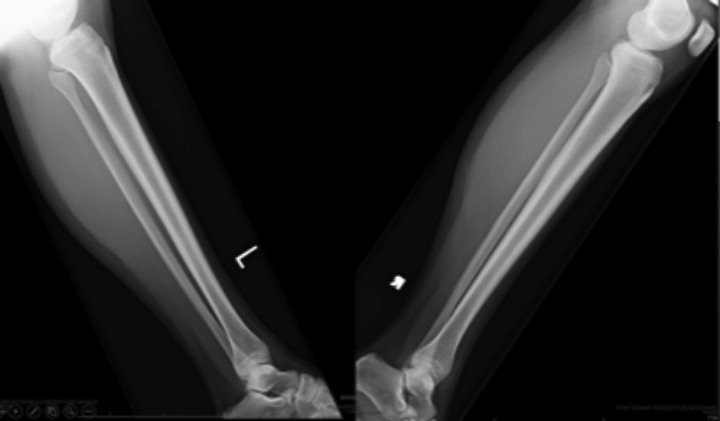 Untreated or chronic osteomyelitis may result in progressive bone destruction, abscess formation, and sepsis with significant increase in mortality. 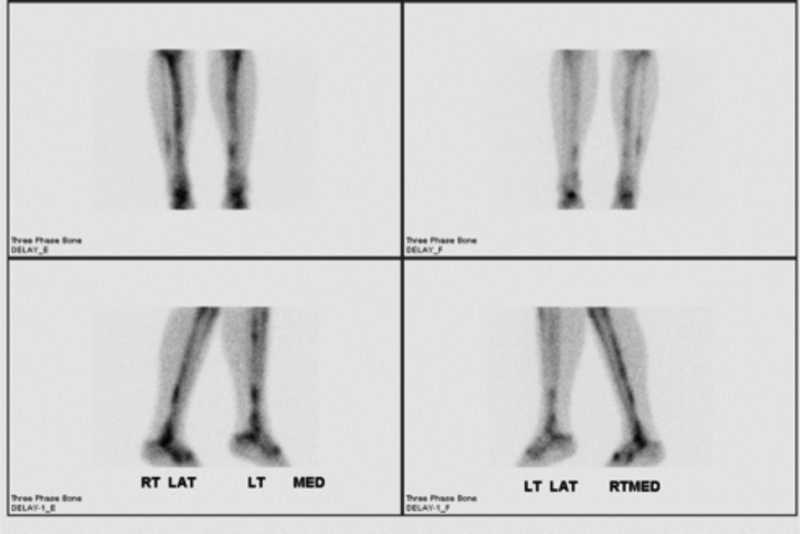 Bone scintigraphy is a useful and commonly utilized tool for assessing lower extremity pain. While the patterns of linear uptake among the differential diagnoses may overlap to some degree, subtle differences may be apparent, which when combined with the clinical picture, provide clues to the underlying diagnosis. Correlation with additional imaging – often radiographs – is helpful in suggesting the most likely diagnosis. Often, the best practical application of bone scintigraphy is when it is normal, providing a high degree of confidence in excluding each of these processes. 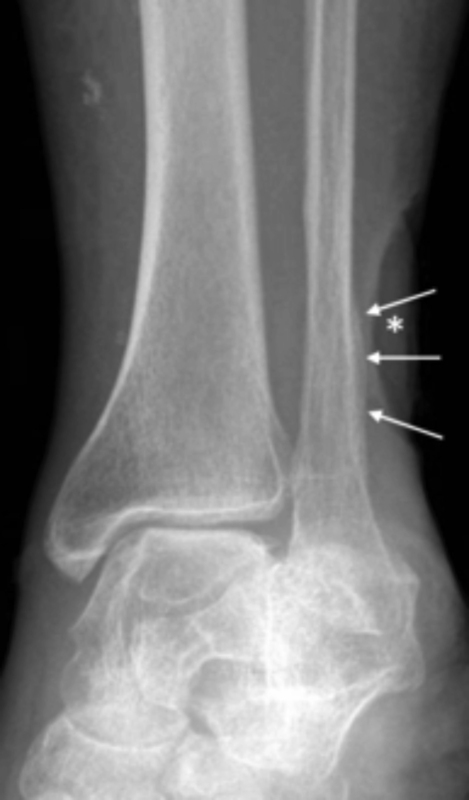 The radiologist should have a general understanding of bone scintigraphy’s role in the workup of a patient with lower extremity pain, be familiar with the common pathologic entities and their presenting patterns on scintigraphy, and be cognizant of the impact of imaging findings in terms of patient management and outcomes. Bhatt R, Lauder I, Finlay DB, et al Correlation of bone scintigraphy and histological findings in medial tibial syndrome. Br J Sports Med 2000;34:49-53. Lieberman CM, Hemingway DL. Scintigraphy of shin splints. Clin Nucl Med 1980;5:31. Holder LE, Michael RH. The specific scintigraphic pattern of shin splints in the lower leg. J Nucl Med 1984;25:865-869. Allen MJ, O’Dwyer FG, Barnes MR, et al. 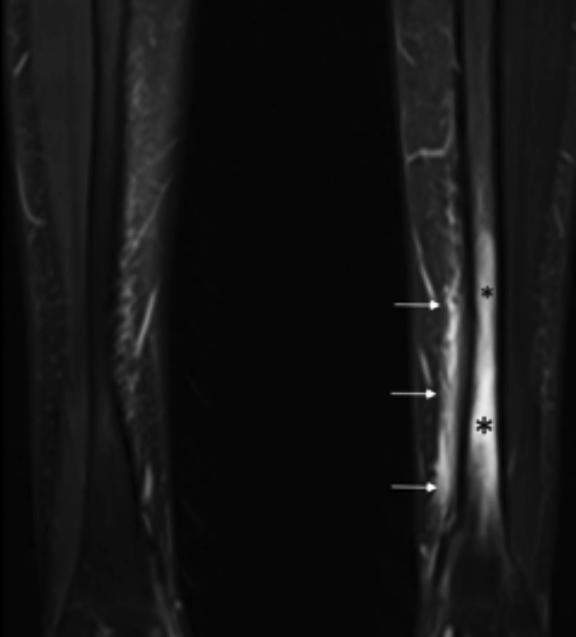 The value of Tc99m-MDP bone scans in young patients with exercise induced lower leg pain. Nucl Med Commun 1995; 16:88-91. Anderson MW, Ugalde V, Batt M, et al. Shin splints: MR appearances in a preliminary study. Radiology 1997;204:177-180. Anderson MW, Greenspan A. Stress fractures. Radiology 1996;199:1-12. Love C, Din AS, et al. Radionuclide bone imaging: an illustrative review. RadioGraphics 2003; 23:341-358. 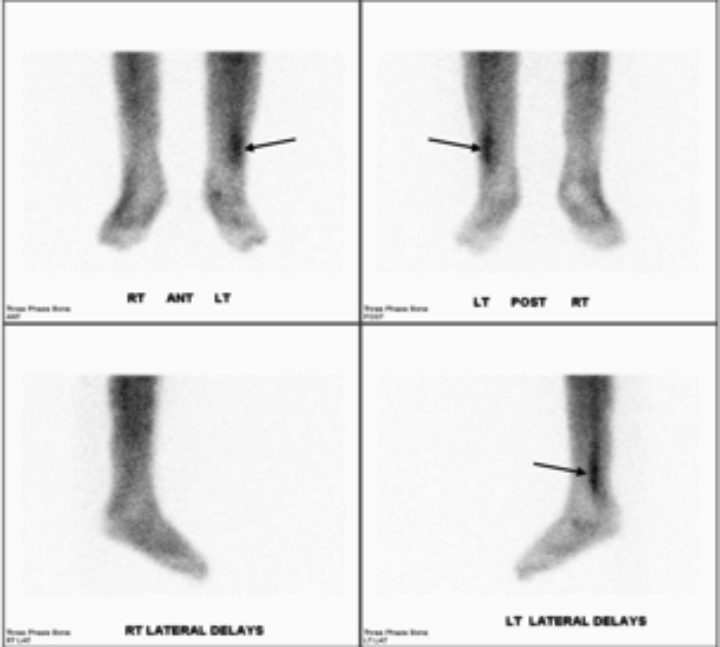 McKnight T. Lower Limb Linear Bone Scintigraphy Activity: A Case-Based Illustrative Review. J Am Osteopath Coll Radiol. 2019;8(1):14-17. Dr. McKnight is the Section Chief, Nuclear Medicine and PET/CT at Beaumont Health – Farmington Hospital, Farmington Hills, MI and a member of the Clinical Faculty at Michigan State University, College of Osteopathic Medicine, East Lansing, MI.